Not that this happens often, but what do you do when faced with a repair where you don’t know the power source but you do know you have to drive LED backlighting? When faced with this dilemma [Eric Wasatonic’s] solution was to design for ambiguity. In this interesting hack repair [Eric] needed to restore backlighting for an old car stereo LCD display. First he guaranteed he was working with a DC power source by inserting a small full-wave bridge rectifier. Then knowing he needed 4 mA to power each LED for backlighting he used some 1978 vintage current limiting diodes designed to pass 2mA each regardless of voltage source, within limits of course. Sure this is a simple hack repair but worthy of being included in anyone’s bag of tricks. Like most hacks there is always knowledge to be gained. [Eric] shares a second video where he uses a curve tracer and some datasheets to understand how these old parts actually tick. These old 1N5305 current limiting diode regulators are simply constructed from a JFET with an internal feedback resistor to its gate which maintains a fixed current output. To demonstrate the simplicity of such a component, [Eric] constructs a current limiting circuit using a JFET and feedback potentiometer then confirms the functionality on a curve tracer. His fabricated simulation circuit worked perfectly. There was a little money to be made with this repair which is always an added bonus, and the recipient never reported back with any problems so the fix is assumed successful. You can watch the two videos linked after the break, plus it would be interesting to hear your thoughts on what could have been done differently given the same circumstances. 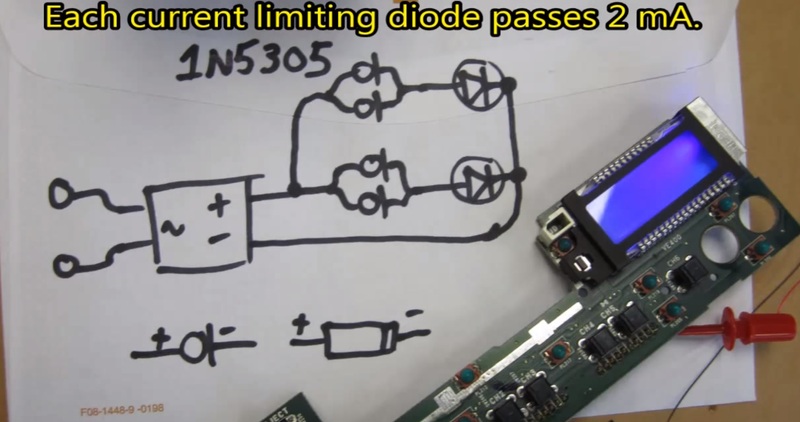 Instead of these exotic current limiting diodes, he could have used a current source or current sink consisting of an PNP or NPN transistor respectively, a (zener) diodes, and 2 resistors. It’s obviously a bit more complicated to build this onto the existing board, and considering it’s a one-time fix, and not a new design, the current limiting diodes seem like a simple solution if you happen to have them on hand. On the other hand, he could have just connected the board to the original radio, and measured the voltage across the broken bulb, and again with a bulb or known resistor across the connections. This would have given him the polarity (if it is DC, which would seem likely), and the source impedance. It is possible the bulbs are driven from a regulated voltage supply, or simply have a resistor in series. It’s also possible the bulbs are driven by a PWM signal. This might seem unlikely, but I’d agree with the author that finding bulbs was unlikely in the first place. (Practicing electronics engineer here) Problem with JFET current limiters are that the max drain currents for available JFETs are quite small. But for smaller LED backlights, it’s just fine, as the article suggests. correct series resistors for the LED current. Parts: 3 resistors and 1 zener diode. are you sure its regulated voltage? anything from 12.8v to 14.8(and higher for some smart charge systems) is not uncommon. appreciate it isnt a big swing, but having just converted the rear of my recovery truck to LED lighting ans re-doing the current limiting resistors in the cheap lights the voltage swing does make a healthy difference to light output when series resistors alone are used for current limiting. think these diodes are quite an elegant simple solution! Not sure if you were replying to me. load dump. i.e. -20V to +40V. Don’t ever assume anything inside an automotive environment. I think tekkieneet is suggesting to use the zener diode as a shunt regulator, with a resistor in series to limit the current through the diode. Because the voltage across the diode is only slightly dependent on the current through it, you can use an LED with a resistor in series on this semi-regulated voltage. The trouble is that the permissible voltage swing is somewhat limited; if the resistor in series with the zener diode is to large, you need a larger voltage to get sufficient current through the LED. If you make the resistor to small, the current through this resistor and the zener diodes would become to large, causing a lot of power dissipation and possible device failure. Also, the zener voltage needs to be significantly higher than the forward voltage drop of the LED, to allow for sufficient voltage margin for the resistor, because the zener voltage varies somewhat depending on the current, temperature, and device variations. It’s certainly possible, but still a bit of a balancing act. Note that the current source or current sink I proposed earlier also needs several volts of margin between the LED forward voltage and supply voltage. It’s not exactly easy to design a simple constant-current source that can work with a low drop-out voltage. power dissipation is 0.05W on the resistor and 0.041W on the zener. That should give plenty of headroom for LED. etc. Zener -> 1W and resistor (300 ohms @ 3W). Sorry that was aimed at the first reply I was just too slow in replying :) basicallly to say a dropping resistor alone isnt really acceptable for use in autos as the supply is pretty poorely regulated. Nice tutorial. Actually it’s very handy to use current limiters or regulators. Time after time I need to build some charger or power supply for specific device (like camcorder). Does someone knows good tutorial on how to build power supply with current limiter for several options – 5v 2A or 3,7v 0.5mA or 3v 4A? Open ended question has many answers. Google hawe answers but google is not an expert. Until now I didn’t find clear tutorial/explanations on how to build secure, reliable power supply for camcorder where for example lead acid battery 12V make 7.2V and not more than 650mA. A simple but not quite elegant option could be to use 2 LM317 or similar regulators in series; the first as a constant current source, with a resistor in series with the output, which drops 1.25V, and the second as a voltage regulator, with the usual voltage divider connected to the feedback pin. Such a contraction would require a voltage margin of twice the dropout voltage of the LM317 (about 2V at 650mA and 25 degrees), plus 1.25V for the current feedback resistor, so about 5.25V in total. This means you would need an input voltage of at least 12.45V, which a partially discharges 12V lead-acid battery cannot provide, but the 13.8-14.4V from a vehicle with a running engine would suffice. You could also use LDO (low drop-out) regulators instead of the LM317’s. http://www.ti.com/ go to tab: Tools & Software. On your left hand side under Analog is WEBENCH® Designer. Plug in the number and out pops a design. The simplest fix would have been to get the rest of the radio and hook it up to get the polarity and voltage. Probably spent more time and money figuring out a work around. Twelve volts is more universal than anything else around. Twelve volt bulbs “grain of wheat” were common. The LED’s could have been in series halving parts count of “rare” “diodes”. 4 mil kind of dim in daylight, no? There’s no resistor in a current limiting diode, it’s just a JFET graded for IDSS.